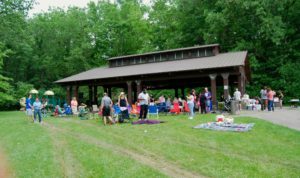 Our annual outdoor church service and picnic held at Morgan’s Hollow in Cleveland. Enjoy some beautiful weather while we worship together outdoors (under the shelter of a pavilion, just in case). Main course and drinks are provided, just bring a dessert or side dish to share. Kids enjoy running around on the playground and participating in games and crafts. Each year Ambassadors Football partners with local churches, football clubs and other organizations across the globe to deliver faith-based football camps as they seek to transform their local communities. The week-long camp at Scranton Road Bible Church culminates with a World Cup soccer tournament, outdoor barbecue and awards ceremony. This annual event is conducted in partnership with Parkside Church. Those wishing to receive a Thanksgiving basket may sign-up in person at the church beginning in mid-October. Home deliveries are made on the Saturday before Thanksgiving, between 10:30am-12:30pm. All are welcome to join us in delivering these Thanksgiving dinner baskets (including a turkey and all the provisions needed to cook a special meal) to families in our community who might otherwise not be able to enjoy the Thanksgiving holiday. It is a wonderful day of blessing for both volunteers and recipients alike.